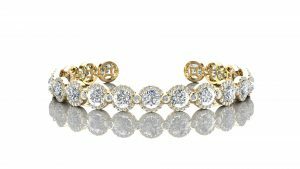 For the largest selection of beautiful bracelets for women in a variety of styles such as the popular diamond tennis bracelet or any type of diamond bracelet, come to Jewelry Design Gallery! -Jewelry repairs: if your diamond tennis bracelet or any other kind of bracelet needs repair, we are a full-service jewelry shop and do everything in house! – Appraisals: looking for a certified appraisal? Come to our shop for appraisals on bracelets for women and any and all jewelry! Our appraiser is a GIA certified gemologist! No matter how you dream up your tennis bracelet or diamond bracelet, our shop will bring it to life! With the latest in 3-D printing technology and a GIA-certified CAD/CAM expert jewelry designer on staff, we cast amazing custom bracelets in gold, platinum and set with any stone! From conception to reality, we work one-on-one with our customers from original molding, to casting to setting stones for all of their custom bracelet jewelry needs. Come see what our full-service jewelry shop can do for your custom bracelet dreams in classic or elaborate styles, from diamond tennis bracelet to gold bracelet styles. Call 732-536-1184 or visit us today in the Towne Pointe Shopping Center off Route 9 in Manalapan NJ.